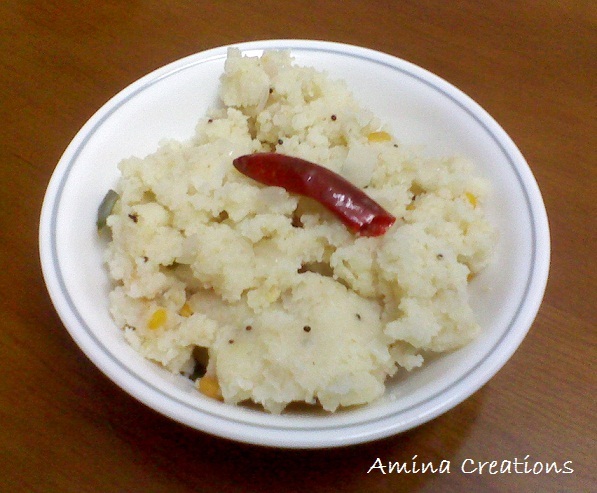 Upma is a delicious and healthy breakfast that is prepared in most homes in Tamil Nadu. This is the basic recipe of Rava upma for beginners and you can also check out other varieties of upma like Tomato upma, Broken wheat upma and Bread upma that I have shared in this blog already. Heat ghee in a pan, add mustard seeds and allow the seeds to sputter. Add onions and saute for a few minutes till they turn golden. Next add dry red chillies, curry leaves and asafoetida and mix well. Then add cashews and saute till this turns golden as well. Now add water and salt and bring to a boil. Then reduce heat and add the semolina slowly, while stirring continuously. Make sure that there are no lumps. Continue cooking and stirring for a few minutes till most of the water has evaporated and large boils are seen. Now reduce heat, close a lid and cook for 2 or 3 minutes. Check if the semolina is cooked and switch off the gas. Serve hot with sambar, and chutney. We usually serve it with groundnut chutney. Delicious rava upma my favorite.